QuickTide tells you the tide times fast" ~ A must have item for coastal photography, kayaking, bird watching, boating, angling, diving, kite flying, walking, metal detectives, geologists, fossil hunters, surfing and also for any family who would like to enjoy more sand on the beach at low tide ! This easy to use calculator (A5 in size) provides excellent prediction times for the high and low water times along the UK's north and Irish East Coast during 2015 and 2016. This version covers from Bangor (West coast) all the way around to Skegness (East coast) which includes the Isle of Man, Scotland and its islands. Simply match the date code to the specific coast colour on the map and rotating wheel and the high and low tide information is clearly established, giving you all the important information needed. This unique (Patented) calculator is sure to save you many hours of time and uncertainty in ascertaining the best time to visit the seaside etc ~ A Really Clever Product and Ideal for Keeping in the Cars Glove Box ! Sunday Times Travel section page 2, 2 April 2000 said... In an age of computers and liquid-crystal displays, it is refreshing to find something simple and effective that doesn't rely on information technology. 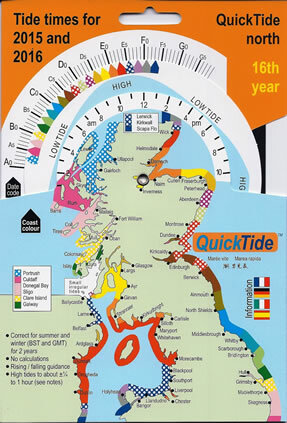 QuickTides are colour-coded tide charts for the coast of Britain, covering this year and next. Select a day and a stretch of coast, then simply dial the wheel to discover the tides during a 24-hour period. This easy to use calculator (A5 in size) provides excellent prediction times for the high and low water times along the UK's South East Coast during 2015 and 2016. This version covers from Bournemouth (South coast) all the way around to Boston (East coast) and includes the Thames estuary in London and the north coast of France including the Channel Islands also. Windsurf Magazine, page 112, Jan/Feb 2001 and page 136 March 2002 said... Sometimes the simple answers are the best. like to windsurf from different beaches these new tide tables from QuickTide are just the biz. This easy to use calculator (A5 in size) provides excellent prediction times for the high and low water times along the UK's South West (and Irelands South Coast) during 2015 and 2016. This version covers from Porthmadog (West coast) all the way around to Weymouth (South coast) and also includes the French, Spanish and Portuguese coast from the Cherbourg peninsular to Gibraltar and also includes the Channel Islands. Simply match the date code to the specific coast colour on the map on the rotating wheel and the high and low tide information is clearly established, giving you all the important information needed.